Koeze Peanut Butter for sale. Buy online at Zingerman's Mail Order. Gourmet Gifts. Food Gifts. We found this peanut butter almost right next door in Grand Rapids, Michigan. Like most of the simple great foods in our catalog (e.g., heirloom corn polenta), it’s the result of much care and very little processing. Jeff Koeze sources great Virginia peanuts, brings them north to Michigan in one-ton sacks and then blanches them to remove the skins and keep them from going rancid (a common flaw in a lot of natural peanut butters, I think). He toasts the peanuts in vintage coffee roasters, adds sea salt, then grinds the mixture to the texture of spun silk (a slightly chunky spun silk, that is). The process is nearly identical to when they first started making peanut butter in 1925. As I heard when I visited, "We're not new. We're not improved. We're making the same traditional product that we've made all along." That traditional product is not an air-whipped, sugar-filled concoction but a natural, intense, rich, mouthwatering sensation that sells out regularly. Get a couple jars, quick. "Coarsely ground in small batches and lightly seasoned with sea salt, it is neither creamy nor chunky but totally irresistible." 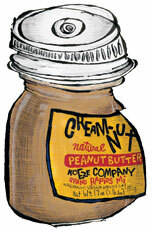 "The Koeze peanut butter is absolutely the best we've ever had. I've been buying expensive health-food store peanut butter for years and none—I mean none—compare." Crunchy: Same great peanuts, left chunky for those who like it that way.